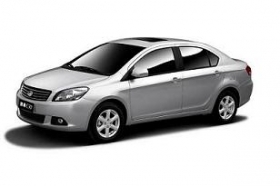 SHANGHAI -- Great Wall Motor Co. will unveil a three-box compact sedan at the Beijing auto show next week. The company expects to sell the car in both domestic and European markets. The new model, known as Tengyi C30, was developed in strict accordance with European safety and emission standards, according to a source at the company's marketing department. With a wheelbase of 2,610mm and a weight of 1,136 kg, the car is fitted with a 1.5-liter all-aluminum variable valve timing (VVT) engine and continuously variable transmission (CVT). Prices of the car have yet to be announced. In July 2009 Great Wall completed the one-year long process of certifying four of its models for the European Union; the Florid and Coolbear sedans, the Hover 5 SUV and the Wingle pickup. It succeeded in obtaining the EU's Whole Vehicle Type Approval for them. To date the company is the first domestic Chinese automaker to have cleared all the regulatory hurdles needed to get its vehicles into the single European market. Great Wall plans to start assembling the four vehicles in Bulgaria for the European market in 2011.